Fall Color in Yellowstone Canyon. Moose wakes up, gets shakily to his feet, and looks around for his girlfriend. With the girlfriend not in view, he initiates a detailed search pattern consisting of trotting around in circles. Photographers are giddy. The search pattern leads him to jump a fence, passing twenty feet from Audrey and I. Note that this is far from safe, but, as Audrey noted, “this is awe-some!”. Also note that I failed completely in getting a picture of a moose jumping a fence. After two loops around the assembled masses the scent of the lady moose is detected, and he follows her off into the woods; photographers rush after the moose, although Audrey and I chose not to join them. After the morning excitement we grabbed a massive breakfast at Jedediah’s House of Sourdough, checked out of our hotel, then spent a couple of hours wandering around the town of Jackson. After that it was time to start the drive of doom home, and with pronghorns everywhere we covered about 300 miles through Wyoming and into Utah. Bull Moose. I am not fully zoomed in, indicating that Audrey and I were somewhat not safe, but very happy. After a number of early days there was very little chance of us getting up early again today, and to no one’s surprise it was nearly 9:00 when we headed out to see the Grand Teton range in the morning light. I failed miserably with the photos, but the mountain range is very, very impressive – a fault in the earth is shifting, pushing the mountains up and the valley down. Currently Grand Teton rises about 7,000 feet above the valley floor, and supposedly if all of the sediment on the floor was gone the difference would be closer to 30,000 feet; God did his work well with this one. Our other big adventure today was lunch at the Amangani Resort, which is the nicest hotel I’ve ever been in. It was a bit odd walking into a place and having the manager and customer service guy both shake my hand, so clearly having Audrey with me fooled them into thinking I was actually a classy guy worthy of a personal greeting. Tomorrow we’re up early (really) to look for moose, then it’s southwards towards home. Grand Teton Fall Color. There was an otter in the river, too, but I didn’t photographize it. Today we left Yellowstone and traveled through Grand Teton National Park, but that news is completely eclipsed by the most amazing stat of the trip – we started the license plate game about ten days ago, and as of today had found every plate but Hawaii; however, we did see two license plates with rainbows, but couldn’t identify the state because the text was hidden by the license plate holder. 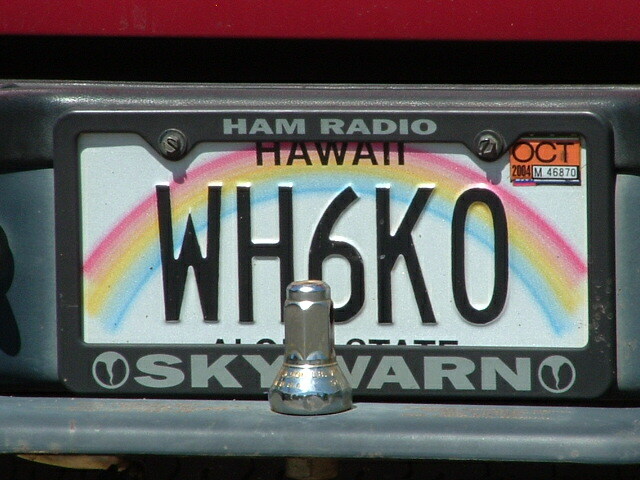 Well, game over, the intertubes has confirmed that was Hawaii – all can stand in awe at our license plate finding prowess. In lesser news, I woke up before sunrise again (Audrey: “Yeah, today I think you can do this on your own”) and went out looking for the blacktail pack, but aside from some brief howling didn’t find any sign of them. The morning still yielded a ton of elk, and it’s always nice to be outdoors early, especially when the thermometer is poking above the freezing mark (33°F, woohoo!). After a bit of lounging back at our cabin we headed south out of Yellowstone, making a ton of stops along the way. At Dunraven Pass we tried to find bears but to no avail, but did have a really fun conversation with a lady who had heard from Glenn Beck that California was shutting off all water to the farmers; that one is a complex issue that Mr. Beck seems to have oversimplified a bit (I know, shocking), so it was interesting to talk about how the California salmon fishery, migratory birds, etc all need Delta water, too. Following that stop we mostly drove straight through to Jackson, WY and found a really nice hotel – it’s the off-season here (too early to ski, too late for summer tourists) so we got a huge discount on a resort room with mountain views. The plan is to spend two nights here, and then sadly we’ll be heading towards home and back to the working world. Today was the earliest day of the trip thus far with a 5:30 wakeup – Audrey was surprisingly mentally alert, although she had scouted the entire town the night before to make sure she could find coffee (for anyone in a similar predicament: there is a pot they keep brewing at the desk of the Mammoth Hotel). After the drive out to the Lemar Valley we joined Russ (the ham radio operator), Rick (the wolf biologist) and a small crowd on a hillside and got to watch three wolves, some bison, a few elk, a pronghorn and a handful of bighorn sheep through the myriad spotting scopes that people had with them. After breakfast the temperature had risen from 25°F to a balmy 35°F so we headed up to the huge, terraced springs that give the area its name. Following that excursion and a short nap Audrey wanted to add Montana to the list of states she’s visited, so we made the quick trip up to Gardiner, stopping along the way to photograph a pronghorn that was standing in a turnout – having recently told Audrey that I thought the pronghorn is the one animal that is so wary that it would never, EVER let anyone get closer than about fifty yards, this fellow spent five minutes posing for pictures thirty feet away from us. We ended the day with a drive up to the Norris Geyser basin which is the home of Steamboat Geyser, the world’s largest geyser, capable of erupting to over 300 feet in height. Its eruption cycle is from four days to fifty years, and with the last eruption having occurred in May 2005 we decided not to wait around to see if it was our lucky day. While the geysers were neat, the highlight was actually the scenery along the drive, including a stop on the outbound and return trip to re-visit with some of the wolf folks who were on the lookout for the Blacktail pack which had killed a bison in the area; we missed the wolves but saw (and heard) a coyote and a good number of elk, and Audrey was given a really cool photo by a really nice professional photographer who was hanging out in the area, so all was well. Grass growing in a hot spring pool. I got all artistic and stuff with this one. After the late night last night we slept in a bit and luckily were able to switch our room to a cabin in the north part of the park, making for a more leisurely day. Highlights of the drive from Grant Village to Mammoth Hot Springs included another stop at Yellowstone Falls, many hundreds of additional bison, a coyote that everyone (including me) initially seemed to be mis-identifying as a wolf, and finally a group of five bighorn sheep wandering along the road. The sheep in particular were very cool, and by driving ahead of them a bit we got them to wander up to us, allowing for extreme close-ups of sheep nostrils the likes of which the photographic community will never condone. The evening activity was a trip out to the Lemar Valley for wolf watching. As everyone knows, the way to find wolves is to look for people with big, expensive spotting scopes and stand next to them, and we were very successful at this. With winds whipping and temperatures in the forties a group of us stood on a hill and watched two black wolves more than a mile away. Seeing wolves is always very cool, but the crowd we were with added a bit of additional color – at one point after noting that the wolves had mange Audrey joked that she wanted to give them some medicine. A guy off to the side in a cowboy hat turned to us and in very serious and thick southern drawl intoned “Medicine? Lady, not in a national park you won’t.” We found out his name is Stacy, he is from Tennessee, and apparently one does not make any off-color remarks about wolves in his presence. We’re heading back in the morning for a bit more wolf-spotting, and based on conversations tonight it sounds like we’ll be seeing many of the same people again. Bighorn sheep. Terrible background on this photo, but I like the eyes. Also, note the nostril detail, clearly my photographic specialty. Don’t let your dog out of the car. Bison and dogs don’t mix. Don’t form a barrier of cars and people in the bison’s path; they aren’t the smartest of animals and “run at the thing that’s in my way as fast as possible” seems like an option that they are not opposed to exercising. When a bison wants to cross the road, let it. Finally, the IQ of some people seems to drop 40-70 points around large, unpredictable wild animals as demonstrated by the old lady and the foreign guy who walked to within six feet of a bison, blocking its path; we drove away before we could witness any potential carnage. Following the bison adventures we did some hiking around Yellowstone Falls, visited with some very friendly and tolerant squirrels and chipmunks, and photographed a herd of deer before grabbing dinner and making the long drive back to our hotel room. Tomorrow promises to be another full day, although sadly it may be our last in the park unless an additional night of lodging becomes available. For anyone visiting Yellowstone in the future: while park rules forbid you from invading an animal’s personal space (25 yards from all animals except for bears which get 100 yards), it is apparently ALSO against park rules to allow an animal to invade your personal space – after an elk wandered to within about ten yards of Audrey and I a ranger pulled over to inform us that we were very, very bad people; he may be correct, but a female elk without a calf that is simply grazing isn’t the most vicious of creatures. That unfortunate incident aside, it’s still extremely cool to see elk and bison at such a short distance. Our day started a little after 6 AM with a trip out to see Old Faithful at sunrise, followed by a stroll around the Upper Geyser Basin. On our way back to the lodge around 10:30 we noticed that Grand Geyser, the world’s largest predictable geyser, was expected to erupt between eight and noon. Figuring it was past due we sat down to wait, and for the next ninety minutes baked under the sun until, at 11:55, a plume of water jetted 150 feet into the air for ten minutes; it was worth it. The afternoon found us in the car exploring some of the other nearby geyser basins, running afoul of the park law, and in general having a very nice time. The pictures below hopefully do a better job capturing the day than my limited grasp of the English language is capable of. Yesterday is the first day of the trip without a journal entry – the blame for this oversight lies with Jacquie, and specifically with the moment after dinner when she asked “have you ever tried absinthe?” Despite being guilty of promoting inebriation, Jacquie and Roy are two of the finests hosts I’ve ever had the pleasure of staying with, and between the amazing meal, the tour leading, the beautiful home, and the ginormous dog that resembled a cow it was a very, very pleasant visit. After an excellent breakfast of sausages, waffles and bluberries, a tour of Lander from Jacquie, and an unfortunate bathroom incident with the very large and temporarily crippled dog, Audrey and I hit the road for Yellowstone, arriving a few hours before sunset. Having never visited this park without seeing massive numbers of animals I gave her an ironclad guarantee of at least two large animals, but one juvenile elk later I’m eating crow. Despite the lack of fauna it’s still amazing – for the first time in my life I’m spending the night in the Old Faithful Inn, and I’m quite literally giddy walking around a six story, 110 year old log hotel that is a few hundred feet from the world’s most famous geyser. We had dinner and a drink in the bar, watched Old Faithful erupt from the deck, and are now heading to sleep in our 100 year old room awaiting any adventure that tomorrow might bring. Life is very, very, very good. The lounging portion of the trip officially came to an end this morning, but not until after I’d spent forty-five minutes chasing around Grand Junction trying to find a Starbucks; needless to say, it was not one of my finest moments. When finally we got on the road we headed up the very scenic Colorado Highway 139, crossing peaks at over 8000 feet with some nice fall scenery, and eventually leading to a lunch stop in Dinosaur, Colorado. The town would seem to have the world’s greatest gimmick given its name and proximity to Dinosaur National Monument, but apparently the closing of the park’s visitor center and the disappointing box office for Jurasic Park 3 has taken its toll. The remainder of the journey took us into Utah and then up through Flaming Gorge National Recreation Area. Thanks to the terrorists we couldn’t walk on or in any way explore the 500 foot tall dam at the head of the gorge (note to the FBI: WTF?) but the scenery was great, and we spotted a bunch of pronghorn antelope as we drove along the ridgelines into Wyoming. Tomorrow we’re off to see some friends, then we’ve got at least four days of geysers, mountains, and being chased by large, angry animals in Yellowstone. Today was a lounging day to allow us to recover a bit from all of the recent hiking and driving. Since we’re in the midst of Colorado’s wine country we made an excursion out to a couple of wineries, but discovered that there’s a reason why those who list the world’s great wine regions don’t generally include Grand Junction; the people here are nice, the wines not-so-nice. Tomorrow we’re driving again on our way to start stage two of the trip (aka Operation Yellow Stones). It is 9:30 at night and I am too tired to write coherently, but luckily lack of coherence has never yet stopped me from putting together a journal entry. Today we hit Arches National Park, and judging by the level of exhaustion it hit back. The morning saw visits to Double Arch, the Windows, and Turret Arch, and at each we ran into a pair of woman travelers who scrambled on the rocks while offering strangely valuable photo tips. After a stop in Moab for lunch we headed to Devil’s Garden for some hiking during the hottest part of the day (solid planning on my part) and sweltered along to the massive Landscape Arch (300+ feet) and then up to the very scenic Partition Arch. The day ended with a climb up to Delicate Arch (the Utah license plate arch for those not up-to-speed on their arch identification). I’ve visited this arch at sunrise when only a handful of hardy souls were present, but never before at sunset when it is a MUCH different experience – perhaps seventy-five people were arrayed around the arch waiting to take photos, with the souvenir-seekers lined up in front of the arch waiting to get their photo taken. One-by-one they stood under the arch, got their picture, and then traded places with the next person in line, all while the nature photographers fretted that they would miss out on an amazing photo while waiting for the Johnson family to get their Christmas card photo. As frustration mounted loud shouts of “Boo!” erupted anytime someone lingered a bit too long. While this may not have been the most serene natural setting it was fairly amusing, particularly when one especially clueless girl stood for a minute under the arch admiring the view while everyone yelled and whistled; when finally she got the hint a rousing cheer erupted from the assembled gallery. Lightning flashed on the horizons during the journey back to our campsite making for an awesome display, and we’re now heading to bed under slightly cloudy skies with hopes of staying dry until morning. Delicate Arch at sunset. This is clearly a prime example of the creativity a photographer can exercise in composing a scene – my thought process: “point at the arch, click the shutter button”. Ansel would be proud. I’m currently sitting in my tent under the most amazing night sky I’ve ever seen – with no moon, at least a 6,000 foot elevation, and a location that is the most remote area in the lower-48 states the Milky Way is lighting up the evening and the stars are shining so brightly that it’s possible to differentiate sizes and colors; Audrey even pointed out what we’re guessing is the space station flying overhead. Being the reliable outdoorsman I left the star guide sitting on my bookshelf, so we’ve been forced to come up with our own names (“Blinky” is popular) but it’s no less incredible without knowing exactly what it is we’re seeing. The route that brought us to this astronomy laboratory started in Bryce Canyon with an early wake-up to see sunrise followed by too many pictures and a visit along the way from a group of pronghorn antelope. This adventure inevitably led to coffee and bacon at the lodge, and then off for more canyon adulation at Bryce Point. After checking out of our hotel the route took us 275 miles across the state and along some absolutely ridiculous roads – apparently the Great Depression led to the ultimate in make-work programs in Utah, and portions of Highway 12 are literally blasted out of solid rock only because someone decided that a good way to create jobs was to build roads through impossible places. In addition to Highway 12, portions of Interstate 70 (“No Service Next 123 Miles”) traverse canyons and cliffs that made it one of the few parts of the interstate highway system to be two lanes up until the mid-eighties when it was finally expanded to match the rest of the system.